Sign and display specialist MediaCo has become the first company in the UK to take EFI’s Vutek FabriVU 520 dye-sublimation printer. The 5.2m-wide machine, MediaCo’s first at this width, was showcased at FESPA 2017 in Hamburg, and came into its Manchester site earlier this month, along with a Vutek HS125 Pro. EFI confirmed that MediaCo was the first in the UK to take the machine and one of the first in Europe. The company has been a frequent early adopter of EFI technology since it became the first UK company to take the original FabriVU around 15 years ago. The machine prints at speeds of up to 446sqm/h, 242sqm/h for production image quality and 157sqm/h for POP image quality, at a maximum resolution of up to 2,400dpi. The four-colour FabriVU uses EFI’s water-based dispersed dye inks and takes a variety of media weighing between 40gsm and 450gsm. 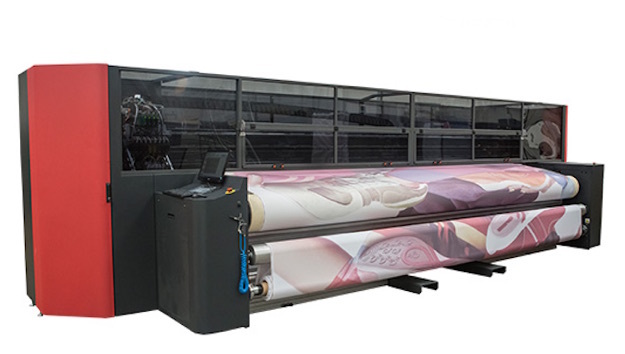 MediaCo mainly opted for the new aqueous-ink dye-sublimation printer due to its ability to print on new materials at 5m-wide without the need for seams. It will be be fully operational by 1st September, alongside a Monti Antonio heat press. Graphics can now be printed with no seams up to 5m-wide wide, and MediaCo can now offer a more extensive variety of fabrics to their customer base. The firm are launching five materials that will also benefit from the ability to print 5m-wide designs. “Over the past 16 years, we have been working towards this position and we are now ready to deliver to our clients the most advanced seamless fabric graphics available in the UK,” Wardle concluded. Founded in 1998, Media Co was one of the first companies in the country to work with and print large-format fabrics, and has worked on projects that have benefitted the likes of Wembley Stadium, museums, retailers, and other sporting events.